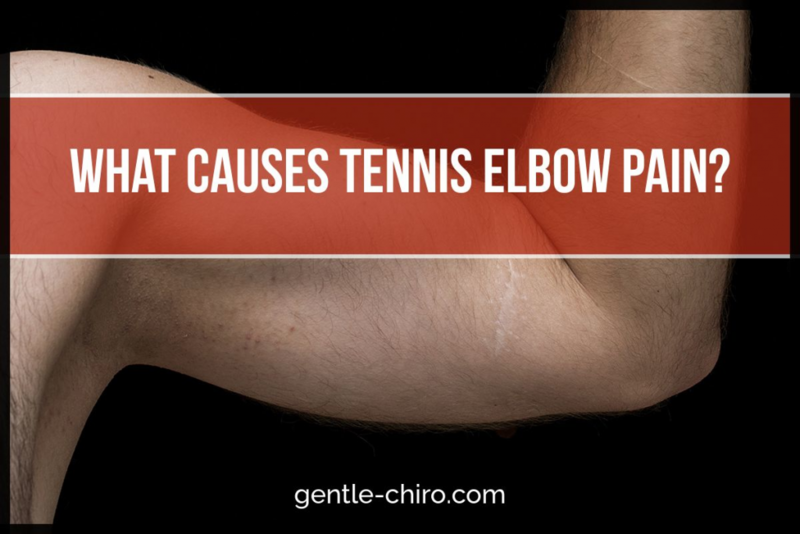 What causes Tennis Elbow Pain? Tennis elbow is pain which is experienced in one or both elbows. It is caused by compression to a nerve known as the “ulnar” nerve. Many people refer to that area as “the funny bone” which is isn’t actually a bone but an area where the ulnar nerve is very close to the surface of the skin. And having a pain there isn’t that funny. What most people are unaware of is that the compression may not be occurring in the arm at all, and may actually be coming from the neck. In this case treating the elbow with a brace won’t actually get rid of the root cause. Even physical therapy on the elbow will only help temporarily and the elbow pain returns. If you have EVER had a whiplash injury to the neck this may be the cause of your Tennis Elbow pain. Let’s say you were rear-ended at a stop light YEARS ago. This causes damage to the lower part of the neck where the neck meets the torso. The bones in that area of the spine are damaged from calcium deposits which have settled there over the years like rust on a door hinge. You may experience other symptoms, and you should look for these symptoms if you have Tennis Elbow. Symptoms to take note of are fatigue especially in the morning, excessive hair loss when washing your hair and temperature fluctuations like feeling too hot or too cold. If you are experiencing these symptoms in addition to pain in your elbow, it means the compression is coming from the neck and not in the arm. This is because the same “ulnar” nerve also controls the organ called the “thyroid”. It’s the same exit off the highway. So if you have a traffic jam due to the calcium deposits in that area of the neck BOTH thyroid dysfunction AND the arm pain will occur. To fix it the situation the bones in the lower neck should be aligned to remove the pressure from the ulnar nerve. And depending on the amount of calcium deposits present in that area it could take some time to fully resolve.